The wind crept into us off the ocean. We pulled our bodies around us tightly. We all shivered anyway. Despite our hats and scarves and sweaters. Despite the sun, the walking. We had been waiting patiently for spring. It's why we came. On the promise of warm weather. Even the dogs were unsure, stopping to kick the sand from their paws, a step here, a step there, looking heartbroken each time. It was then the waves rose higher. Fell harder. The sand held our steps longingly. It all felt like a dream she had, she said. "It was this," she said, one hand holding down her hat, the other spanning across the horizon. "All of this. The people, too." We all nodded, because it seemed reasonable. Like we, too, had dreamt it, or that we were dreaming it only then, or that we had meant to dream it once before. We followed the water’s edge around the bend. There, the stones sat heavy against everything: the tide, our spirits, both breaking slowly in the cold. There was no other way across. Our shoes barely gripped their slick backs. R and A drifted away over the rocks to the smooth sands on the other side, never looking back. The dogs ran even further ahead than that. She looked up but once to calculate the distance trailing behind them that was growing before her. Otherwise, we looked down, troubling the stones with our brand new ambition. The first rocks we lifted were inarticulate. Small, oddly shaped. Each marked the end of an idea. I dug deep, lifted with my legs. My arms burned. This one fit perfectly on its end. The next one did too. Together, they rose like an arm reaching out its hand to be held. Together, both rooted and free. Castle hill rose high above, beside us. A path on the other side of the stones would take us to the top. Loop through the marshlands. Bend back to the bay. Shroud us with tree cover. Some snow still rested in darkened corners behind rocks and under newly felled trees. Some trees still held leaves. Above it all, the sky, blue. “We would take a boat through here,” she would say then, pointing to water snaking through the marshes. A recent history. Not ours. I would imagine it. I would try not to. But it would be in trying not to that does it. In a moment, it would pass. But, in a moment would be too late. My silence would plow at the trail before us. Our steps would slow. The trail would muddy. 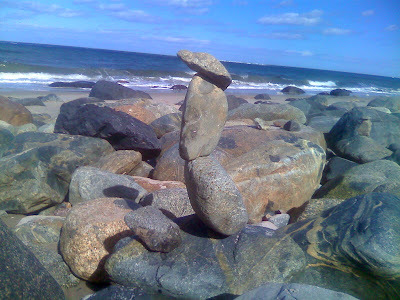 The last rock was not as balanced. Three tries later, I still held it in my hands, cradled it, brushed my fingers over its uneven terrain, sought the point where the weight shifted, pulled the rock down. On the fourth pass, I found it, let the stone rest in my cupped fingers. The edges were abrupt. Not round and smooth like the other two. I was surprised by my choice, by the contrast, that it felt wrong to set it down or to find another. She looked at me and nodded, a smile courting her lips, working through the cold. Her hat lay low over her ears. The wide brim waved in the wind. Her jacket stood stiffly. She waited with me. Hands folded before her. I placed the rock atop the others, sliding it back and forth slowly, seeking balance, seeking the perfect juncture, where stone against stone would hold. The rest of the trail to the top would be quiet. We would stop at the top. Rest on a low wall at the back of the Crane mansion. Gaze across the grounds out over the treetops. It would be much later that she would take my hand. It would be after we circumferenced the house. It would be after we made the long rolling walk to the edge of the greens at the very end of the property to look out over the water, to Plum Island across the bay. It would be after the walk back through the puddled lawns to the path that promised to take us back to the road, to the lot where we had started. It would be at the fork in the road where the path either led back to the house or back to the beach. And her hand would be warm despite the cold, her fingers sliding through and into mine. When we would drift from the path to the road, our arms would be swinging, our hands locked until passing cars forced us on to the shoulder. Single file. No longer silent. I would follow her back to the lot, back to the car, back to the place where we began. R and A would be behind us. The dogs would be behind them. The gravel would be loose beneath our feet. The cattails would bow as we passed. When I lifted my hands, the stone stayed. I lowered my arms, tentatively, my hands still contoured to weight of everything the earth could yield to me without me having to let go, and looked out across the water. The wind was strong, but the stones would stay. They would stay with each step across to the sands on the other side of the rocky terrain. They would stay with each step closer to the path along the marshland. They would stay once we crossed the barrier between beach and grasslands along the river way. They would stay until her hand found its way to mine through the silence. They would stay until we climbed back in the car, dogs and all, where the seats were warmed by afternoon sun, where we loosened scarves and hunched shoulders from around our necks, where the vast improbabilities between where we were and where we were headed were all at once abundant and manageable. And, without a word, we headed that way.